← Relationship: Am I The Wrong Partner? 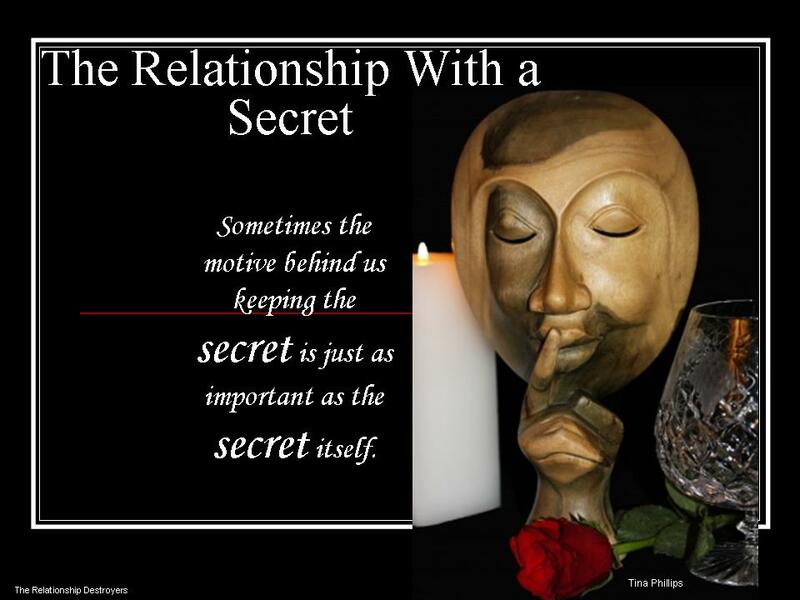 Why do we have secrets in a relationship? We do not want to risk exposure. We do not want to face the pain of our partner in knowing the truth, and lastly, we do not want to lose our partner. Some experts say full disclosure in a relationship is necessary for mutual trust. But if you have a partner who is insecure, you can provide a full colorized biography of yourself, and even that will not be enough. Earning his/her trust will take much more than full disclosure. Knowing when to tell a secret can be tough, because telling everything, especially things that took place before your partner, can be an invasion of your privacy. Only you know your partner enough to know what to share with regards to your past. The decision to tell or not should be based on your best judgment, what type of partner you have, consideration of how holding a secret will impact your relationship should it be exposed, and just as important— your reason for keeping the secret. If you are hiding a secret to avoid exposure of something you have done that is very damaging to your relationship, most likely you know you must come clean. Otherwise, you risk devastation of losing your partner and your relationship. In this case, you must pick your poison. Hide to be exposed, or come clean and face the repercussions. Sometimes the motive behind us keeping the secret is just as important as the secret itself. And the steps we have gone through to hide or cover up the secret, once revealed, will be more damaging when the secret is exposed. When a secret causes you discomfort and guilt, to the point you must relieve your soul, you must do what works for your conscience. You must be able to live with yourself. You have a secret and are deporting yourself in a way, where your partner is suspicious that something is wrong, and he/she has asked if anything is wrong. If you’ve said “no”— you have already started the unraveling of your secret. Anyone with any type of sense can feel when he/she is being lied to. It is only a matter of time now. Although your partner cannot pinpoint precisely what you are hiding, be prepared for the repercussions of the breach of trust in your relationship. You have put yourself on your partner’s radar. If a secret involves you and a few people in the circle of your partner, and your partner is unaware there is a secret among you, and the interaction of those people are closely intertwined, it is quite possible, something will come out about the secret. You can avoid this by telling your partner and dealing with the consequences. It is most likely your partner will feel disrespected, stupid, lied to, and excluded if you don’t share it. If you are certain your partner wants the truth, and he/she entrusts you with their truth and believes in you to do right by him/her, then you should not with withhold the truth. If you choose not to tell the secret, the revelation of your betrayal will go deeper than you can begin to repair, because your partner trusts you implicitly. There are some secrets that probably should not be told. These are very few. Telling can cause a greater disaster or a plethora of devastating repercussions that would have been best left unsaid and taken to the grave. If you must free your soul, go to a confession booth, and leave it there— never to be spoken again. A secret revealed in honesty and openness will be painful, but the information will be relayed with delicacy (well as much as possible under the circumstances). What will be left to deal with are the reactions from your partner. This will be more than you can handle. A secret exposed is compounded by betrayal. This is in part of someone else knowing, at the exclusion of your partner, along with the act which set the secret in place, and the feelings of being deceived in how the secret was withheld. An exposure is never delicately relayed. It is important to be honest about anything that impacts the physical well being of your partner, such as a sexual transmitted disease or anything that can jeopardize your partner’s health. This secret will not be held anyway, due to a doctor and a test result. In this case, your partner will have an impossible time trusting you ever again. There is no action now or in the unforeseeable future that you can use to repair, or win the trust you had with your partner before all of this began. Please think first. Please do not put yourself in this position to have this type of secret. You can’t hide and no one alive can deal with this type of devastation. Be not deceived! Regardless of what you see on television where they are drawing webs of betrayal and deceit; for when it comes to real life, you will have your own drama, you will be relationally destroyed and cast aside in more ways that you can begin to measure. When it comes to secrets, people have little capacity for understanding anything or anyone who intentionally sets out to destroy them. Before you practice to deceive with a secret think far, far ahead. It is not wise to get caught up in your selfish needs, and temporary sexual urges. Stop and calculate the damage that you can see and even that which you do not see. This alone should remove any temptation in the moment. This entry was posted in Settling and tagged hiding behind a lie in the relationship, relationship with a secret, secrets in a relationship. Bookmark the permalink.